With all the stress that's running through the Homer's Travels household, I needed to get away for a few ours so I went on a hike up in the Santa Inez mountains and the Los Padres National Forest. 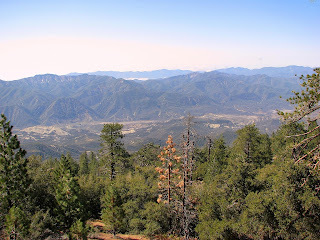 Chorro Grande, spanish for the Big Stream, follows the Chorro Grande creek up to Pine Mountain Ridge. The hike is described as strenuous+ and it lives up to that description. I parked the car off highway 33 across from the trailhead sign. The trail starts climbing immediately. The trailhead is already at 4,042 feet in elevation so this trail was starting out at an altitude higher than the peaks of most of my hikes. I reached my first creek crossing and it was dry. Well, not quite. There were a few stagnant puddles and a really cool drop off that would make a nice waterfall if the water was flowing. All the other creek crossings had water. I was hoping for more because we had some rain the night before. Well, in Oxnard we had enough to wet the pavement but not enough to register in the rain gauge. I was also hoping for snow as the snow level was supposed to be low enough to reach the top of the trail. The trail looked pretty dry so my expectations had to be lowered. At the one mile mark I reached an intermediate high point. On the ground was the word 'HI' written in stones. I would usually have taken a picture of this but the pictures rarely turn out very interesting so I didn't. Use you imagination. Imagine the word 'HI' spelled out in one foot high letters using round stones 1 - 1.5 inches in diameter. Can you do that? I knew you could. I had warmed up pretty good so I took off my jacket and gloves. It had been in the 40s when I started. The trail levels off a little bit for the next mile. At the 1.5 mile point you pass Oak Camp, a small primitive campground surrounded by oaks near the running creek. After this camp the trail becomes a little overgrown. The grass and bushes, some being thorny and raspberry looking but without any berry or fruit to identify them, encroached on the trail. The thorns made me glad that I always hiked in long pants. I had told myself to spray myself with insect spray. I had told the Wife that I would spray myself with insect spray. I was telling myself I should have sprayed myself with insect spray as I was flicking off the first tick. I'd forgotten in my haste to get on the trail. Fortunately I only had to flick off three ticks this hike. This lower part of the trail was a mix of oak, manzanita, and scrub. At the two mile mark the trail starts switchbacking up the ridge. As you climbed higher the trees got bigger and they transitioned from Oaks to Pine Tree. As the trail wound up the ridge the wind picked up and it got really chilly. For the first time on a hike I put my jacket back on. I looked up to the top of the ridge and saw clouds blowing over the mountain top. I hoped that they would clear up by the time I got up there. The switchbacks were really tough. I assume that some of my problem was the altitude. I'm used to being in Oxnard at the towering altitude of 15 feet. Now I was climbing a trail from the 4,000s up to the 7,000 feet level. I was huffing and puffing all the way and stopping often to catch my breath. I was surprised after all the flowers on the La Jolla Trail that there were absolutely no flowers on this trail. I assume it's the altitude. It's probably is still too cold at night for flowering plants. The only thing interesting were the Yucca. 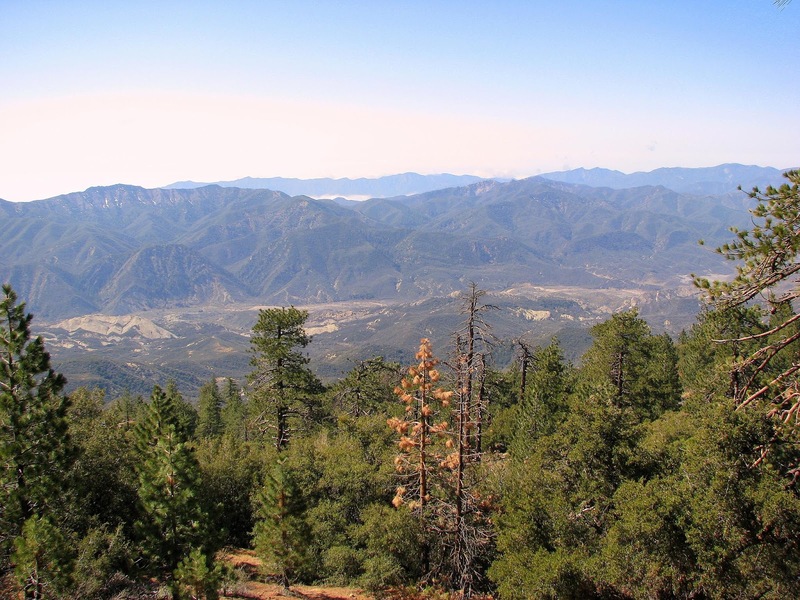 At the four mile mark you reach the 6,000 feet level and I arrived at the Chorro Grande Camp. At this point I also saw lots of snow. The patchiness of the snow told me this was old snow and there was no evidence of any new snow. This is a nice campground with a spring. Some enterprising soul lugged up some concrete and built a small dam making it easier to get to the cool, clean spring water. In the camp I searched for a geocache, "Chorro Grande Springs" but was unsuccessful. As I was exploring the campsite, I discovered that: Rock + Dew + Moss = Slip + Fall + Pain. Fortunately the only damage I suffered is a six inch scrape on my left forearm and elbow. It still smarted though. I gave up the search and headed up some more. The last mile of the trail was well maintained and marked with ribbons and yellow tin arrows attached to bushes and trees. This part up to Pine Mountain Ridge road was also grueling. I was stopping every 30 - 40 feet to rest. I finally made it to the top. I took a left on the road and walked into the Reyes Peak Campground. Before resting I climbed up a little higher and found the "Reyes Peak" cache. I stumbled my way back down to the campground and plopped down on a picnic table and ate my lunch as I was catching my breath. The clouds I'd seen earlier has dissipated but more were coming. The clouds blew into the campground like ghosts. It was kind of eerie. After eating I walked around the campground and took a few pictures of the snow. The camp was full of tall Ponderosa Pines and huge boulders. The views were gorgeous. They say on a clear day you can see the Oxnard plain from here and I believe it. Today the plain was shrouded in clouds. Eventually I decided it was time to go back so I headed back down. It's amazing what you see on the way down. I was so preoccupied with my lack of stamina and general wheeziness on the way up that I missed a lot of the surrounding beauty. On the way down I saw so much more than on the way up. It's also amazing how much easier it is going down then up. Gravity lends a helping hand on the way down. All you really need to do is shuffle your feet forward and back and let gravity do the rest. On the way up, gravity is an a$$. I stopped at the Chorro Grande Camp and took another shot at finding the cache but I was out of luck. I made pretty good time on the way down. I hadn't seen any evidence of people on the trail at all until the very end. There were parts of the trail where the only sign of civilization was the trail that you were on and nothing else. Near the end I ran into an elderly couple. I said hi and the old man smiled and asked where I had hiked to. I told him. He then said that they used to hike in the area but not so much anymore. He commented that it was wonderful living in Ventura County since there are so many good hiking trails and the ocean was close by. His wife was behind him and seemed to be muttering to herself. She raised her voice and complained that her hair was getting in her eyes. The old man said "We have a little Alzheimers." He was smiling when he said this but you could hear the loss in his voice. I wished him a good walk and we parted ways. I needed a distraction from all the stuff happening, or not happening, back home. This hike provided the distraction I needed and the brief conversation with the elderly gentleman put things into perspective. This hike was 10.24 miles with 3,199 feet of vertical. Pictures can be found here. Sounds like a nice hike. I wonder if the spring flows year round? Might make for a good backpack trip at some point. GH: I think the spring at the Chorro Grande camp flows year round. You can actually drive within one mile of the camp. I hiked the long way. I think I'm obsessed with the macro and super-macro settings. I think I take more macro pictures than regular ones.